VpCI-819 Wax/Rinse shines, seals, and protects metal surfaces using vapor corrosion inhibitors. VpCI-819 is formulated for application in high or low pressure sealer arches in automatic car washes and is safe for all paint finishes. 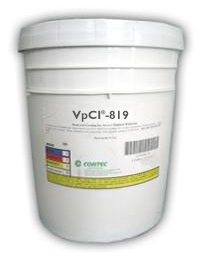 VpCI-819 penetrates into finishes, sealing paint and metal surfaces from the damaging effects of corrosion. VpCI-819 provides a lasting shield of protection against sun bleaching, oxidation, and corrosive aging of vehicle finishes. VpCI-819 also provides corrosion protection for car wash equipment, extending the life of the equipment; up to 30%. VpCI-819 Wax/Rinse should be applied to painted finishes with high, medium or low pressure spray. No other finishing treatment is necessary before air drying surfaces. VpCI-819 Wax/Rinse can be wiped or buffed off surfaces, creating a deeper shine. The recommended dilution ratio is 1:10 with water. The average per car for car wash is 6-8 oz. (around 200m of diluted product). Available in 5 gallon plastic pails (Cortec Product # 12500615) or 55 gallon metal drums (Cortec Product # 12500616). 5 gallon drum weighs 50 pounds and ships under our standard shipping rates. The 55 gallon drum must be shipped by truck. We will provide you with a freight quote before we ship this product. Do not allow product to freeze.